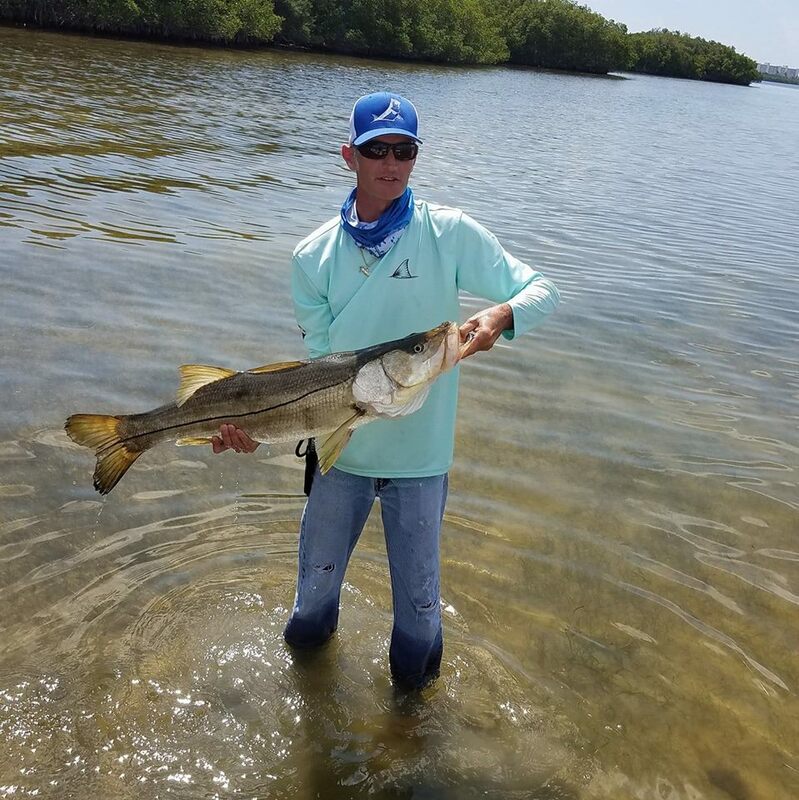 Kerry Bruce with a beautiful South Florida snook while wearing our new Tarpon hat and redfish performance shirt. Thanks for the kind words Kerry and beautiful fish! While we are sure Kerry’s angling skills played a major role in catching that beautiful fish you see, there is something to be said about the confidence you gain when you know your fishing apparel is made of the best quality and fit. Kerry’s new fishing hat with our tarpon design is a great example of our customers requesting a specific fishing product and Skiff Life listening and answering the call. These flex fit hats are a first for us, requested by fans at our local shows. These flexfit fishing hats feature a spandex meshband which serve two purposes a.) they retain the shape of the hat for years to come b.) the material acts as a moisture wicking material that wicks away sweat. The same material is used for the meshback which serves the same purpose but also provides sun protection and ventilation. Have you ever had a fishing hat that makes your head hot in summer? This fixes that problem. The fishing design you see below is custom embroidered with the highest thread count in the industry. You won’t find a more complete, detailed design in a fishing hat. The end result? Like Kerry, you enjoy a comfortable day on the water while fishing and by Skiff Life using quality materials we’ve guaranteed that you can use our fishing apparel for years & years to come…ie. Your NEW Favorite fishing hat. Next us you’ll notice Kerry’s moisture wicking fishing shirt in our fantastic seagrass color. Here is a dirty little secret about fishing apparel, especially shirts. All of the “moisture wicking” material is polyester. Yep, like the leausure suits of the 1970’s. LOL…of course, these shirts are spun a bit different but that is the material we all use and the “magic” material that “wicks” moisture away from the body when you wear a performance fishing shirt. So that shirt you are buying for $60 other places? Well, that is the same material we’ve priced at around $30. Fishing is expensive enough, we have no interest in breaking the bank when you buy a Skiff Life Moisture wicking fishing shirt. These performance shirts feature a UPF/SPF rating of +50 so they not only lightweight but also protect you from the most harmful of the sun’s rays you may not see by the naked eye. These shirts feature designs that are dye-sublimated vs. the cheaper vinyl “iron-on” our competitors use. Our dye-sublimated designs guarantee the shirt will not fade or the fish design will not crack. Quality fishing shirts and affordable prices is what Skiff Life offers. From all of us at Skiff Life, have fun our there fishing & boating, be safe and please keep in touch with your fishing adventures!